Mike Cuales (left) and Arthur Earnest (right) examine the Matterport camera virtual scans. All photos by Thomas Crocker. What type of feed mill will you have and where will it be located? What type of animals will you feed and how many? These are the questions students in Feed Manufacturing Technology (FM 425/525) have to think about to complete their “build your own feed mill” assignment. A team of DELTA staff are working on a Blended Learning grant to create a few key deliverables to enhance the student learning experience in FM 425/525. 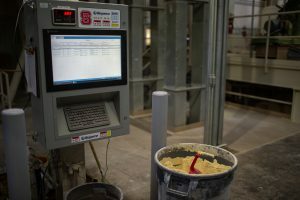 Assistant Professor of Feed Milling Adam Fahrenholz and Area Specialized Agent for Animal Food Safety Marissa Herchler are the subject matter experts on the grant. The DELTA team includes Instructional Designer and Project Lead Caitlin McKeown, Sr. Educational Media Designer and Media Lead Donnie Wrights, Lead Project Coordinator Samantha McCuen, Instructional Media Producer Arthur Earnest, and production help from Andrew Wiedner, Karen Jones and Creative Director Mike Cuales. Much of the grant work is focused on revamping the “build your own feed mill” assignment. Previously, students were required to create a certain scenario for their feed mill, decide what equipment they would need and then draw a layout of where the equipment would be placed inside the mill. The possibilities for how students completed this assignment varied. Some students used paper and crayons to draw their feed mill and others designed it digitally — which also made it more difficult for the instructors to grade since each submission differed. McKeown described Herchler’s vision for how to narrow the scope of the assignment was to better guide students through the thought process of designing their own mill using a decision tree. This is where the questions of what type of feed mill and how many animals, etc. come in. 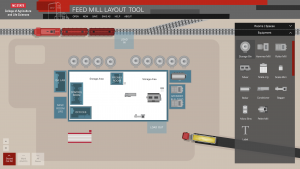 Screenshot of the Feed Mill Layout Tool. The decision tree is being designed as an interactive PDF and has a series of questions that students answer to determine how much and what kind of equipment their feed mill will need. The PDF is printable and savable, both options the instructors were looking for. “The decision tree takes students through the thought process they would need to go through if they were really creating their own mill,” said McKeown. She explained the flow and order of processes is really important in feed milling. The decision tree is designed to help students think about the flow. The next deliverables are the flow diagram and layout tool. 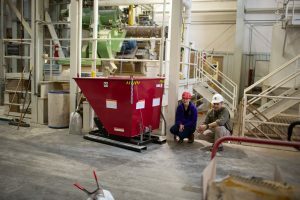 As students are answering questions in the decision tree, the equipment they need will appear in a flow diagram to further emphasize the connectedness of each process in the feed mill. The decision tree exercise will populate the library in the online layout tool. This is where students are actually assembling the layout of their feed mill. They will drag each piece of equipment into the layout in the correct flow and order needed for each process. 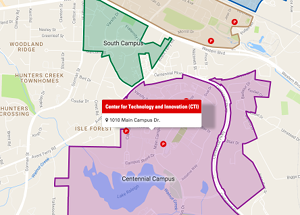 “Students are having the same experience in terms of using the layout tool and they still get the flexibility of deciding where they want to put things and how they want to lay it out,” said McKeown. She added since students are creating layouts on this one tool, it will make it much easier for instructors to grade. In addition, the uniformed layout tool allows students to focus more on the actual design of the mill. Since all the shapes of each piece of equipment is already designed, students do not have to worry about overcoming any artistic or technology barriers. “Students only have to think about what the mill needs to look like so it can function, so I think we are removing some of those other barriers that may have been making it hard for students to complete the assignment,” said McKeown. Other key deliverables include a virtual tour in Matterport and a 360° introduction video. 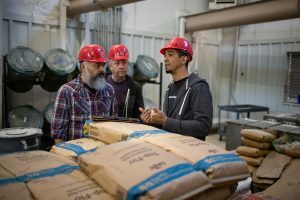 Inside the NC State Feed Mill Education Unit. Feed mills are large and noisy facilities. With multiple floors and loud sounds when all the processes are taking place, it can be difficult to conduct a tour of the facility. Students in FM 425/525 have one scheduled tour of the mill each semester; however, it can be hard to hear and see every area of the mill, especially the higher floors. That’s where the Matterport virtual tour comes in. Matterport is a camera system that captures an environment in its entirety. It captures color and depth to create a virtual experience similar to being there in person. 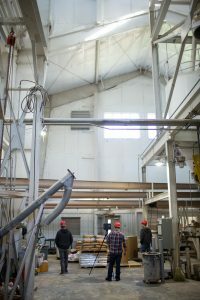 The Matterport scan captured all seven floors of the mill allowing students to click around and explore all the different areas of the facility. “By using the Matterport tour, students can do the tour part ahead of time from home. 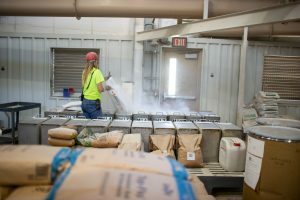 When they get to the mill, they can actually go through the process of creating feed and seeing everything working instead of just touring around,” said McKeown. She added having students better use their time at the mill was a major goal for the instructors, especially since they only get one in-person visit. In addition, the Matterport virtual tour includes hotspot videos of various processes at the mill. Earnest shot videos of trucks coming into the mill and receiving ingredients as well as feed being loaded for shipment, processes that are not happening every day at the mill. “We were able to capture those processes so everyone can see them regardless of when they would have been there,” said McKeown. In addition, DELTA staff members created a 360° video to serve as an introduction to the course. Herchler had already begun working on a 360° video prior to the grant and wanted to expand on it. 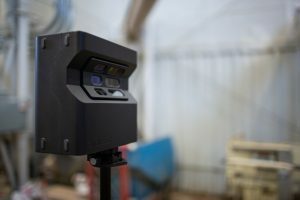 “The 360° video is like a teaser where you can see everything in the mill, but then you can jump into the Matterport scan where you can explore each area,” said Wrights. The grant incorporates both the undergraduate- and graduate-level FM 425/525 and has an extension component, as well. The virtual tour and 360° video will be used in the extension courses to generate exposure to the feed mill. “Additionally, one of our main goals for the 360° video was to be able to use it in as many different ways as possible. We would eventually like to potentially use it as a training tool for industry and investigators alike,” said Herchler. Marissa Herchler (left) and Adam Fahrenholz (right) observe the Matterport scan out of view of its capture. Herchler and Fahrenholz also plan to share the components of the grant with the feed mill industry at meetings/conferences. “We showed off some of the unfinished Matterport footage to some industry representatives at a Meeting in March, and they were very excited to see a true tour of a facility. I think it is very important to keep the industry engaged in what’s going on in the classroom,” Herchler added. For DELTA, this is one of the first times Matterport has been used on a large-scale project. It has proved to be beneficial and taken much less time than originally planned. 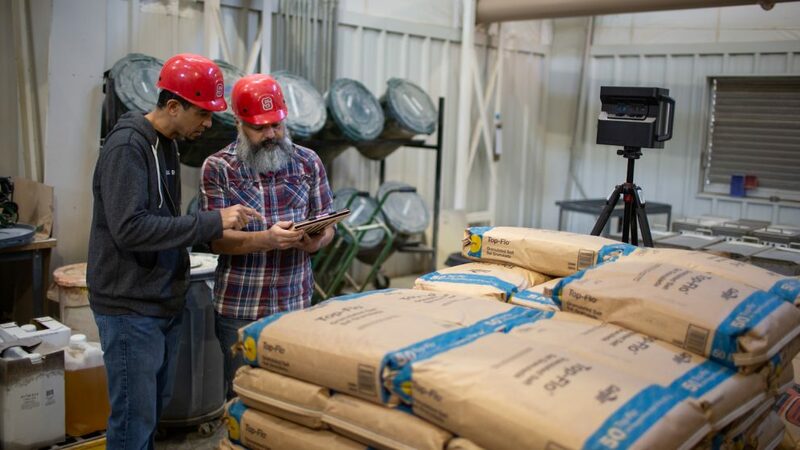 The instructors are even exploring purchasing their own Matterport in order to create scans of brand new feed mills, so students can see what functioning, commercial mills look like. FM 425/525 will go live in fall 2018, and the results of the grant will impact many students in future semesters.